I needed to convert a text document with personal data to an Excel spreadsheet. I wanted to use Neo Office (Open Office) but couldn’t find a way to import text, so I fired up my Windows XP virtual machine, and installed an old copy of Office 2000. After googling, I found that it’s fairly easy to import text as long as there is some sort of delimiter like tab, comma, semi-colon separating the data. Initially, I tried comma, but didn’t work well, since some of the text data already had commas, so I decided to use a semi-colon delimiter. I typed a semi-colon after each section & painstakenly removed each line break. I worked in small chunks, importing after a few sections. This was taking forever. I needed a short cut! 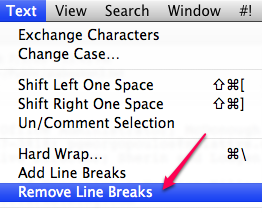 Since I was using Text Wrangler, I figured there might be a way to automatically remove the line breaks. Yay! Found it. Text>Remove Line Breaks. Couldn’t be easier! I selected each section, added the suffix of “;” then removed the line breaks. Text Wrangler cut my work in half! NOTE: When Text Wrangler removed the line breaks, it added a space in between the items, so that messed up my spreadsheet by adding a space before each item in the cell. Before I imported, I did a “find/replace” and replaced all the ;(space) with ; and that worked! Now, I don’t know what text editing applications can do the same thing, but I suspect you’ll find this functionality available somewhere. 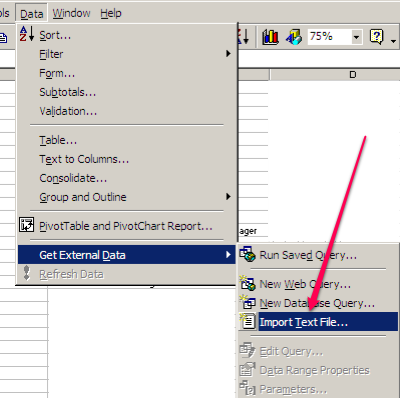 Using Open Office you should be able to use find/replace commands to get the data formatted in the way you need it. Wow, thank you so much Brian! This is so helpful. It looks like ^$ will do the trick!